Columbia are being forced to do precedent-setting studies well beyond normal environmental impact assessments. Normally, the US Army Corps of Engineers determines the scope of the environmental studies after local consultation. The corps has announced what environmental critics call a narrow study largely focused in and around the Millennium Bulk Terminals site on the Columbia River and the Gateway Terminal site near Bellingham and the Canadian border. But, in what has been termed “an episode of eco- brinkmanship,” the Washington State Department of Ecology joined by the local Cowlitz and Whatcom Counties have “reached far beyond the normal scope of environmental impact studies” by requiring Millennium and Gateway Pacific to include global warming effects from burning the exported coal in Asia and such things as the rail impact as coal is shipped by train from the Powder River Basin in Montana and Wyoming through Washington State. Four proposed coal export terminals on the West Coast of North America are jumping through hoops no one has had to tackle before as bureaucracy and environmentalists combine to make life tough. Once there were up to seven or so coal export terminal projects in the Pacific Northwest, but sagging coal prices and heated opposition have thinned the ranks down to only a handful today and there’s no certainty in the current environmental climate that any of them will go ahead soon. There are no existing coal export terminals of any size on the West Coast of the United States. Proponents remain undaunted and are rallying the troops for support through labour unions hoping for the extra jobs and in communities which also need the wealth from the work. The campaign against coal in the Pacific Northwest has never been more sustained. So much so that in Canada a Coal Alliance has been set up by all segments of the coal chain to battle misinformation about one of the nation’s bedrock revenue generators. The alliance contends strongly that it is unlikely coal dust from passing trains en route to the existing coal export terminals such as Westshore Terminals and Neptune Bulk Terminals in Vancouver will have health impacts on the public. Gateway is now spending another US$7 million to meet the over 40 different topics of the wider environmental review ordered by the state, on top of $2 million already spent on the Environmental Impact Statement review process.This stage will take another 13 months or so. “We are sticking with this, we are in this for the long term,” says Ritzman. A draft EIS (environmental impact study) should be up for review in the first quarter of 2015, he adds. In British Colombia — where Fraser Surrey Docks plans to bring in coal from the rich seams of the Powder River Basin, carry it by barge to offload at Texada Island in the Strait of Georgia, where it will be loaded on ocean-going vessels and shipped to Asian markets — the permitting authority is the landlord, Port Metro Vancouver (PMV). However, there has been so much angst about coal train traffic — despite the fact that coal trains have moved through the area to two major export terminals for up to 44 years with few complaints — that PMV has asked Fraser Surrey Docks to provide technical clarity in its Environmental Impact Assessment (EIA) on so-called human health issues. A few local municipalities in Greater Vancouver have also joined together to condemn coal traffic and were probably the reason why the port asked for the extra health risk assessment, which goes well beyond the confines of all previous EIA studies. The Corporation of Delta, through which Westshore bound coal trains now travel is concerned about additional FSD coal trains and has even set up an independent committee to look into the terminal proposal and any possible health issues. While the committee has no weight with the port or any real clout except public sentiment, it symbolizes the environmental anxiety when it comes to moving coal through residential areas. The attack on coal is unrelenting, yet it is the major export through Vancouver with over 38mt (million tonnes) shipped in 2013.Westshore Terminals in Delta moved 30.1mt of that with a record 9.6mt of US product, including 278,000 tonnes of petroleum coke. The keenness to get into coal exports stems from a 75% reduction in container business on the river thanks to larger ships and shipping line consolidations. 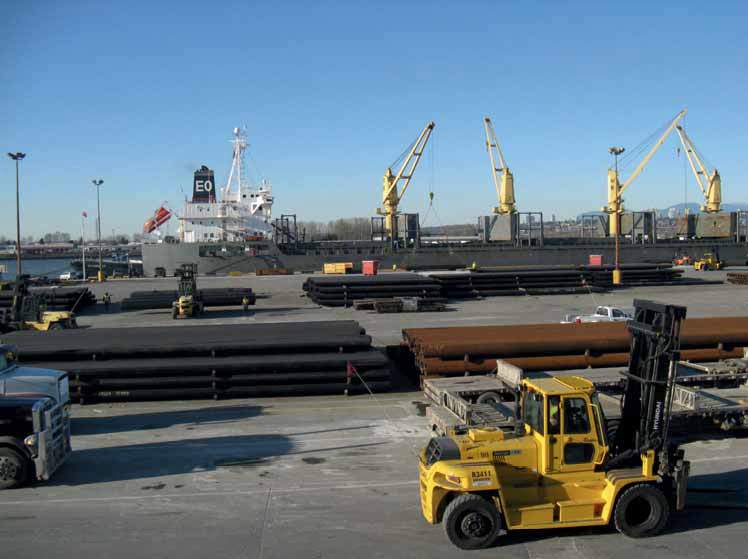 In 2013, FSD moved 1.1mt of combined cargoes led largely by steel imports and raw log exports. Scott says the additional health information sought by Port Metro Vancouver as part of the permitting process should be submitted by May and he expects a decision from the port authority in June. The one coal export terminal proposal that seems to be proceeding at a reasonable pace is in Oregon, where in its Morrow Pacific project,Ambre Energy plans to barge over 8mt of Powder River Basin coal down the Columbia River from the Port of Morrow near Boardman to the Port Westward Industrial Park in the Port of St Helens. The coal storage will be enclosed and the custom built barges covered as Ambre is committed to meet “the high environmental standards set by the state of Oregon,” says Clark Moseley, CEO of the Morrow Pacific project. So far, the Oregon Department of Environmental Quality has issued air quality, water quality, and construction storm water permits for what is known as the Coyote Island Terminal at Boardman. At the Port of St Helens the Oregon Department of State Lands has recently said the project will need submerged land leases to go along with the land leases it already has at the port. Morrow Pacific — Ambre Energy of Australia plans to barge about 8mt of low-sulphur coal from Boardman on the Columbia River to the Port of St. Helens in Oregon. There will be no coal visible thanks to covered barges and enclosed ground storage. Millennium Bulk Terminals — another Ambre project with Arch Coal Inc., Millennium is cleaning up and redeveloping an abandoned 416-acre Alcoa aluminium smelter site on the Columbia River at Longview WA. It plans to build a new import-export facility on the site for bulk materials, especially coal with shipments planned as high as 44mt. the Canadian border, this SSA Marine terminal project at Cherry Point WA plans a multi-commodity facility to export 44mt of coal per year in its first phase, rising to 56mtpy, which will make it the largest coal export terminal on the West Coast. Grain and potash are also possibles. Fraser Surrey Docks — part of Port Metro Vancouver in British Columbia, FSD plans to offload Powder River Basin coal from trains and barge it to Texada Island in the Strait of Georgia about 100km northwest of Vancouver for transshipment to ocean-going vessels destined for Asian markets. The Macquarie Infrastructure Partners owned existing deep-sea port facility plans to ship about 8mt a year initially.